Get all the tools you need for the job in one kit. 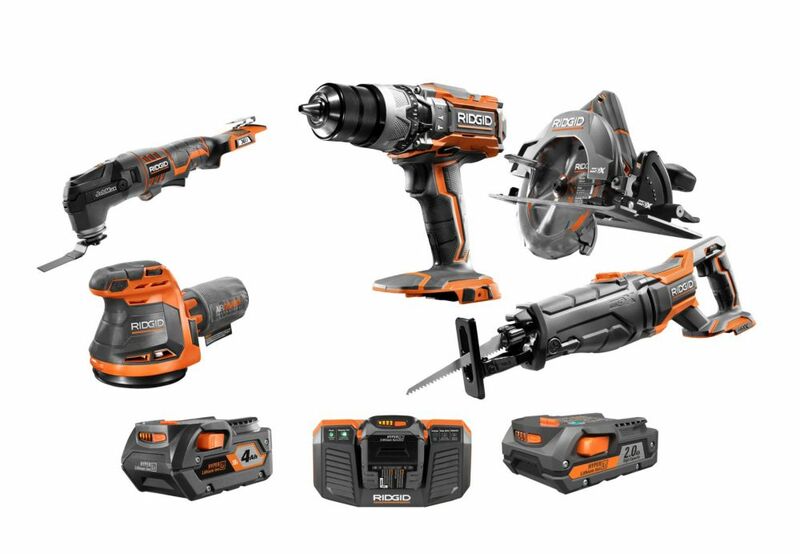 The 18V Cordless 6-Piece Combo Kit with (1) 4.0 Ah Battery and (1) 2.0 Ah Battery, Charger and Bag from RIDGID includes 6 common tools: a hammer drill, a 3-speed impact driver, a reciprocating saw, a circular saw, an orbital sander, a JobMax multi-tool, a 4.0 Ah battery, a 2.0 Ah battery, an 18V charger, a tool bag and an operator's manual. You'll also get free batteries, free parts and free service for life when you register the kit within 90 days of purchase. Powered by a brushless motor, this four-tool kit offers excellent power and longevity. It includes a 1/2 in. hammer drill/driver, 1/4 in. hex impact driver, a reciprocating saw and an LED work light. It features a POWERSTATE Brushless Motor, REDLINK PLUS Electronic Intelligence and REDLITHIUM Battery Technology, this results in longer motor life, more run time and more power. The POWERSTATE brushless motor works harder and lives longer, while quickly reducing noise and cooling more to deliver years of maintenance-free performance. The Milwaukee REDLITHIUM XC 5.0 Battery is a durable pack, providing up to twice as much run time than standard lithium-ion batteries. REDLINK PLUS Intelligence hardware and software is an advanced system of cordless power tool electronics that will maximize performance. Compact, lightweight and powerful, the Ridgid 12V lithium-ion Drill and Impact Combo Kit features a two-speed drill/driver which is the strongest in its class with industry-leading torque (400 inch lb.) and variable speeds (0320/01300 RPM). This drill/driver is the most compact 12V available, with a full chuck and clutch which accepts all 1/4 hex and conventional round bits and it is ergonomically-designed to feel incredible in your hand as you work. The Tri-Beam LED lights provide optimum illumination and eliminate shadows on the work surface. The RIDGID 18V X4 Compact Cordless Drill Console (Tool Only) is a console tool that you can conveniently add to existing kits to help create a tool kit customized to your needs. Compact and lightweight, this drill has a 4-pole open frame for superior power and 535-Inch lbs. of torque to tackle you most demanding applications. Loaded with features for ease-of-use and more versatility, including grip light technology which engages a LED light by simply holding the tool and an innovative Hex Grip for a secure grip and maximum comfort, this tool is durably made for long-lasting and reliable use. 18V Gen5X Cordless Combo Kit (6-Tool) with (1) 4.0Ah Battery and (1) 2.0Ah Battery, Charger and Bag Get all the tools you need for the job in one kit. The 18V Cordless 6-Piece Combo Kit with (1) 4.0 Ah Battery and (1) 2.0 Ah Battery, Charger and Bag from RIDGID includes 6 common tools: a hammer drill, a 3-speed impact driver, a reciprocating saw, a circular saw, an orbital sander, a JobMax multi-tool, a 4.0 Ah battery, a 2.0 Ah battery, an 18V charger, a tool bag and an operator's manual. You'll also get free batteries, free parts and free service for life when you register the kit within 90 days of purchase. 18V Gen5X Cordless Combo Kit (6-Tool) with (1) 4.0Ah Battery and (1) 2.0Ah Battery, Charger and Bag is rated 4.6 out of 5 by 100. Rated 5 out of 5 by Brian from Love it!... Love it! Rated 5 out of 5 by Anonymous from Great product. Love all of my Ridgid tools!... Great product. Love all of my Ridgid tools! Rated 4 out of 5 by Scott from The six tool combo is very nice. Everything works well... The six tool combo is very nice. Everything works well and the batteries have a decent charge life. The only issue I have is that the circular saw runs in reverse of what it should. I will be contacting Ridgid tools concerning this. Rated 5 out of 5 by Lyle from Great product! Significant upgrade from the Ryobi cordless tools that... Great product! Significant upgrade from the Ryobi cordless tools that I had! Would highly recommend. Rated 5 out of 5 by Richard from Great deal on excellent tools. The drill driver feels very... Great deal on excellent tools. The drill driver feels very sturdy and the impact has tons of power to drive any screws. Can't wait for upcoming projects to use all the rest of the tools. Also got my Lifetime Service Agreement setup in no time. Thanks Home Depot! Rated 5 out of 5 by MP2ndArmDivFwd from More than what was expecting from the quality of the... More than what was expecting from the quality of the tools to the life of each charge on the batteries. Great value! So what is the warranty? There is conflicting information on this page. Two locations indicating a 3 yr warranty and the Overview indicates a lifetime warranty. So long as you register the equipment within 90 days of purchase and submit proof of purchase to Ridgid, you will get a lifetime warranty. You must register.